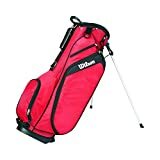 Keep your golf club selection tidy and ready for play, with the Wilson Profile Golf carry bag which includes a 4-way divider top (10″ x 7.5″ size) and a surprisingly light weight at 1.9kg (4lbs). This fantastic-looking bag allows for improved shaft protection with a mesh fabric in the top cuff, and comfortable transportation on the golf course with a double-padded strap. Furthermore, there is a selection of pockets including a hefty side pocket for essentials, a special pocket for valuables, an extra bottom front pocket, and a dedicated pocket for accessories. The bag maintains stability even when placed on uneven surface, thanks to a top-mounted kick stand.